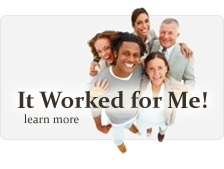 Safely remove skin tags at home within just one to three weeks. The only organic treatment available for skin tags, Skin Tags Control Extra Strength goes the extra mile. With a variety of certified organic ingredients made in an FDA-registered facility, Skin Tags Control Extra Strength is safe to use and effective in skin tag removal. Results are guaranteed. 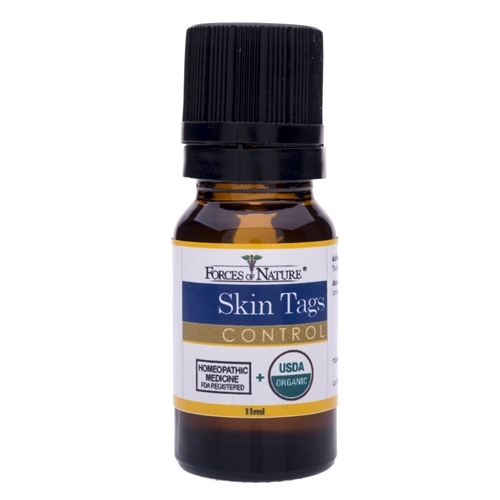 Skin Tags Control Extra Strength contains naturally occurring phytochemicals and antioxidants to help dry out skin tags; ingredients include certified thuja occidentalis and calendula to heal the skin as well as certified organic sesame oil, lavandula super oil and tea tree oil. These ultra-potent phytochemicals provide therapeutic value and effective results without any harsh chemicals, pesticides or toxins. Application is simple: Just shake the bottle and apply up to three times per day. Skin tags typically disappear in one to three weeks. 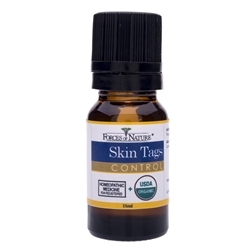 Skin Tags Control Extra Strength is designed for the removal of non-cancerous skin growths. The proprietary formula for Skin Tags Control Extra Strength was developed by the Forces of Nature medical team, including a naturopathic doctor and a staff biologist specializing in plant medicine. Forces of Nature’s mission is to provide innovative natural medicines which deliver results to bring healing to the world. Like all of Forces of Nature’s organic products, Skin Tang Control Extra Strength comes backed by a one-year, money-back guarantee. In just days, Skin Tags Control Extra Strength takes control of skin tags and leaves beautiful, smooth skin. Simply rub directly into problem area. Apply three times per day while problem exists. Shake bottle before applying. For external use only. Avoid contact with eyes. In case of accidental ingestion, get medical help or contact poison control hotline at 800-222-1222. If problem persists for more than thirty days after use, see a doctor or qualified health professional. If redness, irritation, or swelling occurs discontinue use and consult a physician.